When you think of businesses buying products or services for their company, you might picture an employee staring at your home page, trying to brainstorm ways to make a compelling case to the boss. As a B2B company, you’re probably inclined to breathe a sigh of relief–thank goodness you optimized the consumer experience on your site, so you can reach qualified leads at their monitors, when and where they need you the most. Sure, it would be nice if the B2B marketing stopped there, but we’re not so lucky. In reality, today’s business types aren’t just sitting at their desks all day, staring at a monitor, perusing new software opportunities. Many of them are traveling, or maybe they work from home. These days, you’ll be hard pressed to find a business person without a smartphone. And since these business people are the leads you’re hoping to lure in with your marketing; it begs the question: do you have a mobile marketing strategy in place? While it may seem that mobile marketing would be less pertinent for a larger B2B strategy, it’s important to recognize that in the age of smartphones, mobile marketing matters. Mobile marketing is pretty much how it sounds. It’s marketing, only in the context of a smartphone. That means you’re producing mobile optimized content, you’ve designed mobile-friendly websites, you’re using SMS marketing messages, and finger-friendly forms and buttons. It’s a much more personal version of the digital marketing you’re likely already doing. But you’re marketing B2B–why does mobile marketing matter? Research conducted in 2015 found that 72% of Americans own a smartphone. A pretty convincing statistic. Americans love their smartphones, so it makes sense, as a product or service, to try and meet them there. Need more convincing? 83% of adults ages 30-49–typical working age–own smartphones. 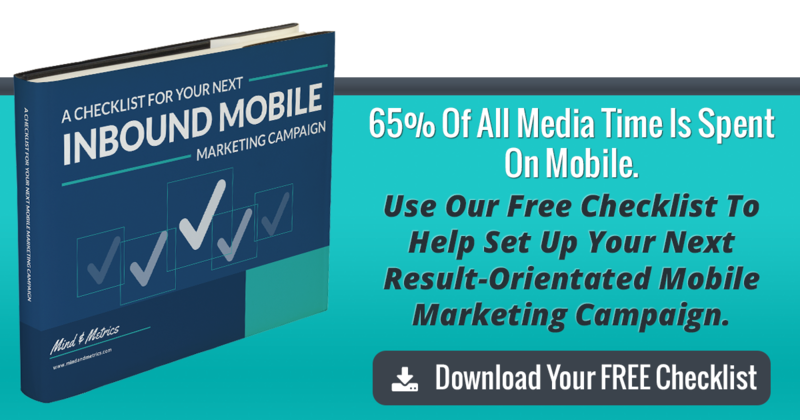 If you’re looking to capture leads, you’d be well served to do some mobile marketing. You might be thinking: simply knowing that working professionals own smartphones is not enough to assume that they’ll be actively engaged with your brand on this channel. And you’d be right. Remember those busy professionals above? Those busy professionals represent at least a portion of your target audience. And those busy professionals want to be able to research business solutions at their convenience. There’s a good chance they’ll turn to their phones. In fact, according to Forbes Insights, 7 out of 10 senior executives use mobile devices to research products and services. Most B2B leads prefer to do a hefty amount of independent research before entertaining a sales call or live demo. B2B buyers are looking via phone, so you’ll want to make your presence known (via phone). A large part of the time spent on mobile devices is consumed by social media. More specifically, 20% of the average smartphone user’s time. This includes cruising apps like Twitter, Pinterest, Facebook, and LinkedIn, among others. And busy professionals are no exception. If you’re not actively marketing on mobile, you’re missing a lot of opportunities. Social platforms are the ideal place to engage with potential clients. Not only is it a sure bet you’ll find them there, but it’s also a place where content can be published and distributed. Users who like what they see from your brand will like or follow you, deepening your relationship. A prime example of inbound mobile marketing at work. And all of this in the palm of one’s hand. In addition to social media apps, people use their mobile devices to open and read emails. And they’re doing it a lot–54% of email is now opened on a mobile device. So if emailing is a part of your larger B2B marketing strategy (which it should be), then you’ll want to make sure you’re emailing for mobile first. Mobile marketing is also another opportunity to gather data and behavioral information about your target audience, and more specifically, individual leads. With this information, you can generate very precise and accurate ad audiences to make your ads more effective, and your ad dollars go much further! Once you’ve begun to capture data and captivate your audience, you can use mobile marketing to continue engaging with your most qualified prospects in ways that are highly personalized and proven effective. Think SMS messaging and push notifications. Whether you’re using an app or relying on SMS messages, following up on mobile is easier because you’re speaking to just one single user. Plus, tactics like this can be incredibly effective. For example, push notifications record open rates as high as 80%. B2B mobile marketing has proven itself increasingly useful for B2B marketers. Mobile marketing is a more flexible, agile, and personalized channel than most other marketing outlets. You can leverage inbound mobile marketing tactics to increase sales. So make a point to work a mobile-specific strategy into your plan. Playing in the mobile game will help you stay modern. Need help building your B2B mobile marketing strategy? Give us a shout!